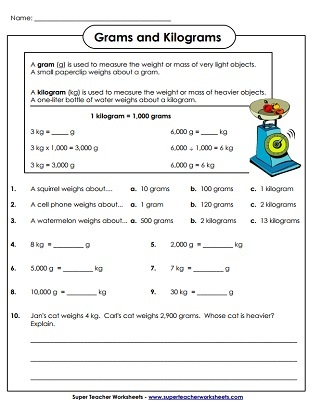 These measurement worksheets will help students learn to: measure the mass or weight of objects in metric units (kilograms and grams), estimate the mass of given objects, convert mass from grams to kilograms and vice-versa. Circle the best mass estimate (grams and kilograms) for each of the objects pictured. Convert weight amounts to and from grams and kilograms. 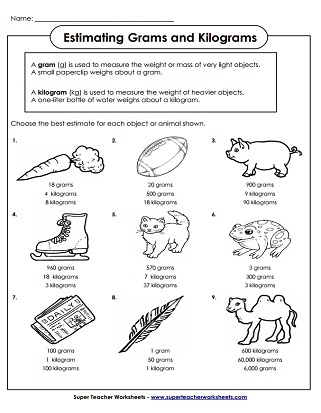 A page of word problems for measuring weight in grams and kilograms. 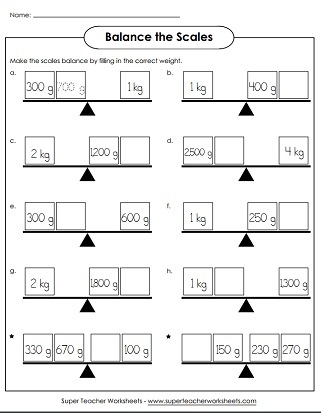 Calculate the correct mass amounts to make the scales balance.